Words play an important role in the wonderful world of tattoos. While most of us think of tattoos as containing all manner of amazing designs, drawings, pictures, emblems, tribal markings and so on, the humble word – usually, but not always in English – is also a vital part of the modern tattoo culture. Phrases, quotes and personal statements. A tattoo consisting of a single word can often convey as much meaning as a body covered in tattoo art. If chosen wisely, a simple, lonely word can somehow capture the essence – the heart – of the wearer. It may be a bold statement about the world, life or humanity; or maybe it will suggest what the wearer’s life and purpose are all about. It can convey our deepest held beliefs, our aspirations, or the manner in which we wish to live our lives and connect with our fellow men. Can all this really be taken from a single word? Well, it depends on the word, of course. Some words may just give us a hint of these things, but there are many well-chosen words that can do just that. Or they can ask a question, or leave us wondering, or mystified as to what the wearer is all about. Possibility, Gratitude, Alive, Saved, Love, Always, Choice, Wanderlust, Strong, Adventure, Chance, Forgive, Freedom, Here, Now, Laugh, Acceptance, Happiness, Danger, Faith, Harmony, Darkness, Healing, Regret, Change, Chaos, Life, Nobility, Charm, Heaven, Fertility, Resilience, Holy, Spirit, Honesty, Respect, Closure, Honor, Obedience, Anguish, Determination, Devotion, Fidelity, Lotus, Romance, Apology, Commitment, Sacred, Compassion, Forgiveness, Loyalty, Paradise, Attitude, Passion, Friendship, Immortality, Balance, Serenity, Peace, Fulfillment, Independence, Perseverance, Beauty, Belief, Courage, Duty, Piety, Creation, Mercy, Ecstasy, God, Infinity, Birth, Effort, Elegance, Integrity, Empathy, Moon, Power, Energy, Prayer, Enigma, Morality, Equality, Eternity, Prosperity, Purity, Kindness, Knowledge, Existence, Strength, Truth, Trust, Tolerance, Tranquility, Tenacity, Tenderness, Unity, Understanding, Virtue, Victorious, Versatile, Worthy, Wisdom….. I bet you didn’t realize that single words could contain so much meaning until you read the above list, which is by no means all-embracing. Without a shadow of a doubt, the choice of single words you can ink on your skin is endless and is only limited by the size of your dictionary and your own imagination. It is difficult to go wrong with just a single word tattoo, but even so, some people manage to screw it all up. It goes without saying that you must always ensure that the spelling is correct, as there is nothing that can cause more embarrassment than misspelled word in a tattoo. Also choose the body location carefully. Do you want the whole world to see it, or do you wish to keep it private, or semi-private? Make sure the font and size look right to you and get the artist to do a mock-up of the real size in a sketch before they start inking. Again, difficult to get this wrong, but make sure that the chosen word will not cause offense to any person or group of people. Finally, make sure you are satisfied that you can live with this word on your body for the rest of your life. As with all tattoos, you should always go to a reputable studio, such we have at ALL DAY TATTOO in Bangkok, where our artists will do their very best to ensure there are no screw-ups. Quotations, extracts and other statements have been part of the tattoo culture for a very long time and in recent years have become more and more popular. Young people who are starting out with their first tattoo often choose a quote which makes a statement to the world of where they stand on a certain issue or philosophy or political viewpoint, whereas older people often like to ink a quote about something that they have struggled with during their lives. Then we have the celebrities with their own agendas – often to create something that will connect them with their fans such as a song lyric, or something shocking or unique, that sets them apart from others and becomes a big hit on social media. As with single words, short sentences, phrases, and quotes can also be chock full of meaning – often with more clarity than with a single word. But make sure the meaning will not be misunderstood, or cause offense. And again – be absolutely sure you can live with your chosen words for the rest of your life. Please remember that a statement of love to your beloved, which includes their name, may not be a great idea, as nearly all of us go through several relationships in our long lives. Your family is with you forever, but that doesn’t necessarily apply to your partner or spouse. Some popular Latin quotes, such as “Alls grave nil“(” Nothing is heavy to those with wings”), “Luceat lux vestra” (“Let your light shine”), “Carpe diem” (“Seize the day”),”Veni, vidi, vici” (‘I came, I saw, I conquered”),”Temet nosce” (“Know thyself”), are starting to spring up on the bodies of the young and beautiful. 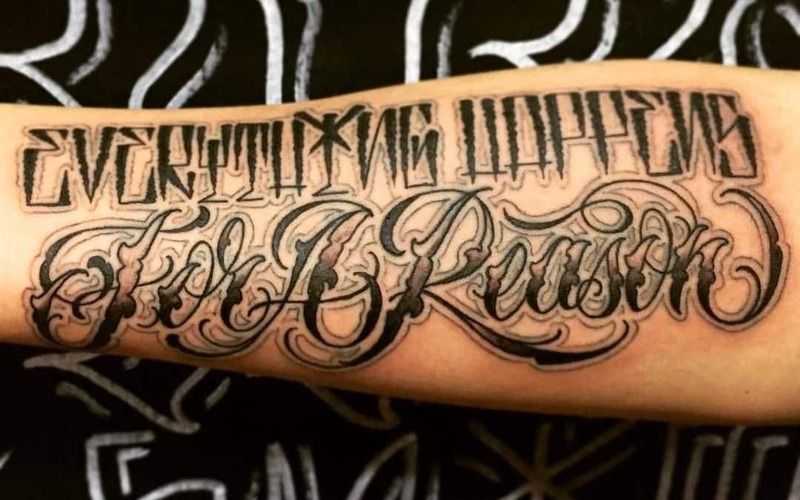 As with tattoos in English, it is absolutely imperative that the Latin spelling is correct and that it means exactly what you intend it to mean – so do your research. Any of the above examples of quotes or single words can also be part of an overall tattoo design – either enclosed in the design itself, or at the side, or under, or over the main tattoo. If you choose to insert words in your tattoo picture or design, then make sure the artist understands the precise position and the size of the lettering in relation to the overall tattoo. Also, ensure that the words are easy to read; if you opt for really fancy font then it may make the words illegible. It might seem a relatively simple matter to ink words onto your body, but as can be seen from the above, there is all manner of pitfalls that can ruin your tattoo dreams. Errors, which at best can make you a figure of fun and at worst, can result in anger and offense from the people around you. Here at ALL DAY Tattoo, we will help you through this potential minefield, and try to ensure the words are spelled correctly, and that they mean exactly what you intend them to mean. While we can’t promise to accurately vet your Latin words, using any foreign language, such as Thai, is another potential “banana skin.” Here, at ALL DAY Tattoo, we will do our best to sure your Thai is correct and has the right meaning. Check our Faqs and arrange your no-obligation consultation with one of our artists and discuss your ideas for words. Whether it is a single word, a short phrase or a complex sentence, we are here to help you decide on where and how they should be inked, and give you a good idea on how they will look.